I decided to fully insure my boat as it was new. I had some trouble initially as most insurance companies do not like to insure boats going offshore if they are less than 30'. I did find a company who would do it and it cost me $1,200 a year. 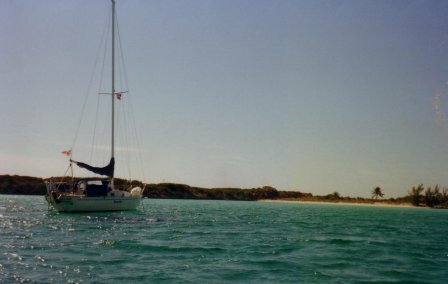 Most cruising sailors do not insure their boats. You also may want to have health insurance. I was able to extend my Canadian health coverage for a couple of hundred dollars but this is getting more difficult now. Most cruising folk seemed to be very healthy and even colds and flu are non-existent. I once went to a dentist in Coral Gables just south of Miami to have a tooth filling and I was only charged a nominal $50 when the dentist heard I was cruising. I took my boat out of the water half-way through the trip to redo the bottom paint and hauled out at Stuart in Florida. The cost of haul out, storage for three days, and back in the water again, was very inexpensive, just a few hundred dollars. Very efficient operation. Sailing on the high seas is not exactly conducive to wild shopping sprees, at least if you like the out-islands as I did. The only other expenses I had were suntan lotion and film. There are freebies too - in Elizabeth city they provided cruising sailors with free bicycles, and in Beaufort, N.C. we had the use of free cars for grocery shopping! In Washington they provide all the facilities of the marina (just minutes from the Smithsonian) as a reward for sailing up the 120 miles of the Potomac river!